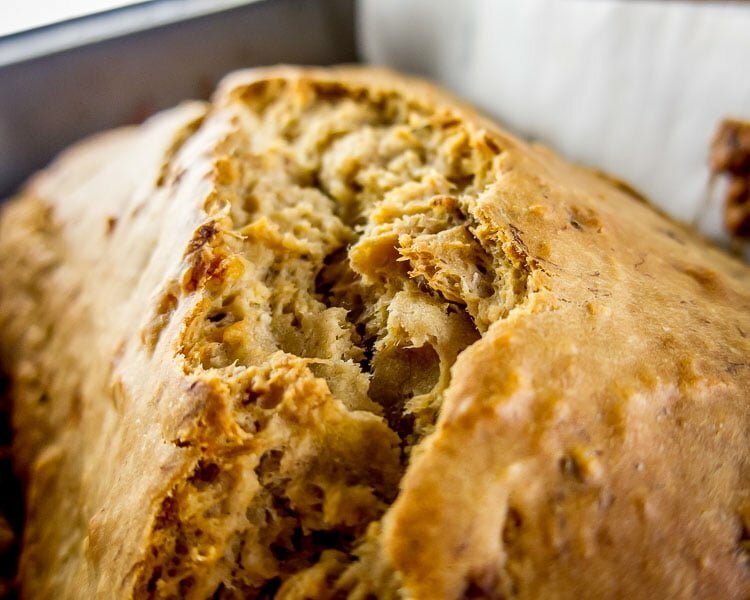 Our next dish for St. Kitts and Nevis is a banana bread. 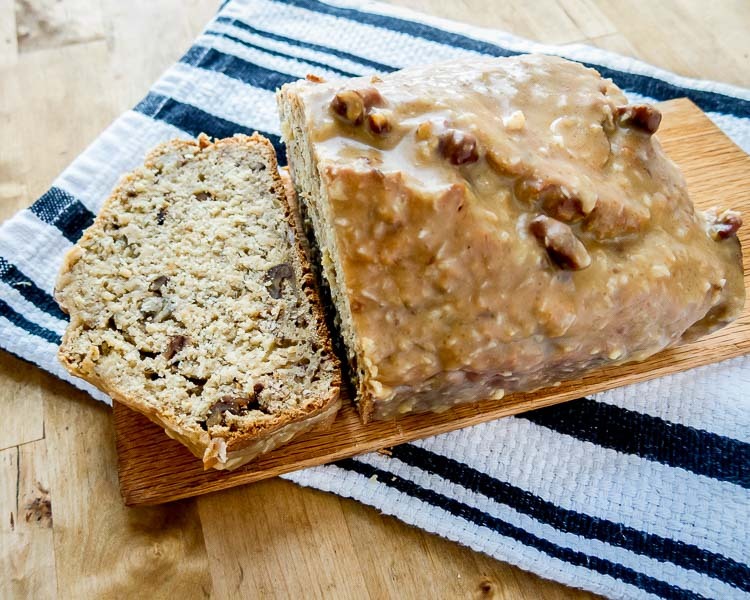 This recipe is a more tropical take on the standard banana bread you would find in your grandmother’s cookbook. 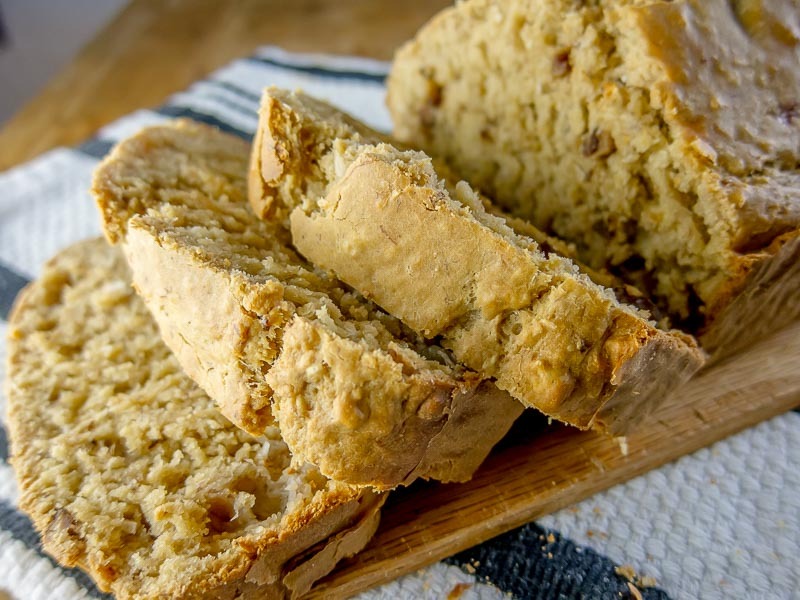 The one you probably grew up with is a sweet quick bread, while this one is not overly sweet. It is a lighter bread that is reminiscent of a tropical island with additions such as coconut, lime juice, and dark rum. 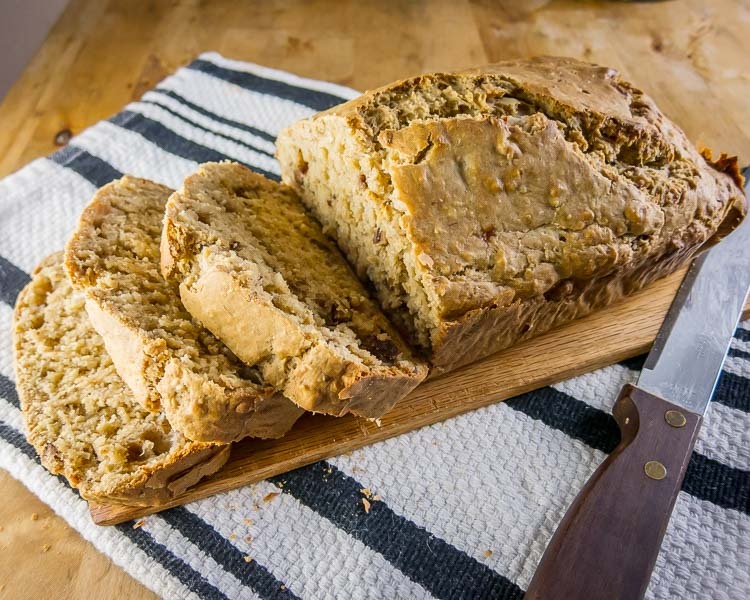 This delicious bread is sure to be a crowd-pleaser in your home and fits well at any meal. Making it is quick and easy. First, set your oven rack to the middle and preheat to 375F (190C). Grease a standard 8×4 or 9×5 loaf pan. Cut a sheet of parchment paper so that it will lay in the bottom of the pan and come up the two wide sides of your loaf pan. This will help it to release very easily! Trim any excess paper that extends beyond the lip of the pan. Now, let’s prepare the dough! Simply mix 2 Tablespoons of butter and 2 Tablespoons of cream cheese in a large mixing bowl. Add 1 egg, 2 mashed up ripe bananas, 1 teaspoon of vanilla extract, 2 Tablespoons of dark rum (we used Cruzan Black Strap) and beat thoroughly until incorporated. In a separate bowl, whisk together 2 cups (250g) flour, 2 teaspoons of baking soda, 1/8 teaspoon of salt, and ¼ cup brown sugar. Stir in ¼ cup of chopped toasted walnuts or pecans and ¼ cup of shredded desiccated coconut with the dry ingredients. Add 1/3 of the dry ingredients to the wet ingredients and fold in carefully. Repeat two times. Be careful not to overmix and develop too much gluten or the bread will get tough. Mixture will be quite thick, and that’s okay. Spread it into the bottom of your loaf pan and bake it for about 40 minutes checking in the last 10 minutes with a toothpick for doneness. As with all cooking, it is best to rely on your senses over the time a recipe gives you because your equipment may be different than what a test kitchen developed. For this bread, to test by plunging a toothpick into the loaf and check to see if it comes out clean. Test a few different areas, and if it is clean, you’re done! Pull it out and drop the pan on a rack for 10 minutes. Remove the bread from the pan and let it cool completely. Once cool, you can make the glaze. It is made by mixing 2 Teaspoons of butter, 2 Tablespoons lime juice, 2 Tablespoons dark rum, and ½ cup of turbinado sugar in a small saucepan. Heat on the stove over a medium heat until hot and bubbly. Stir in the powdered sugar ¼ cup at a time until the mixture becomes more viscous, like honey. Pull it off the heat and stir in 2 Tablespoons of nuts and 2 Tablespoons of shredded coconut. Spoon this mixture over the loaf of cooled bread sitting on a rack. Cover the top and sides completely. Allow the glaze to cool and set for about 30 minutes. Slice it and enjoy! I like it straight up, but butter would also be delicious. The lime juice and rum and a whole new element to the glaze that you wouldn’t otherwise expect. 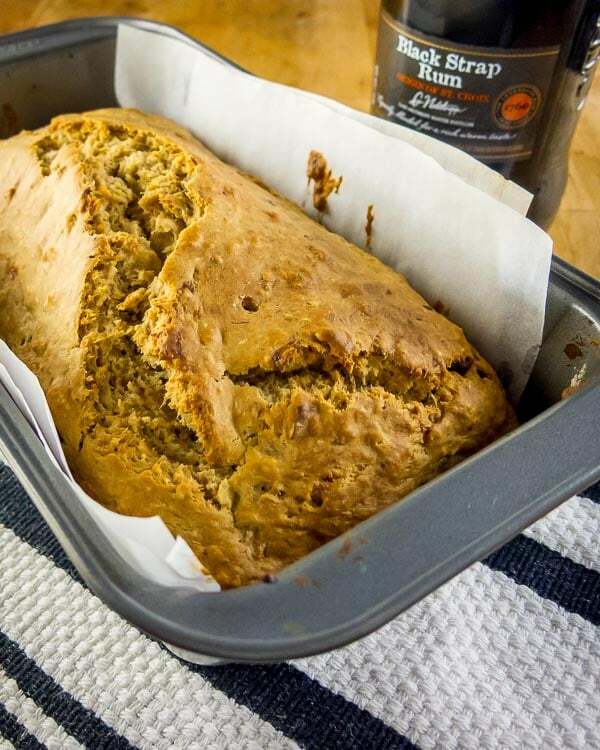 The tang is something normal banana bread doesn’t have and is a very welcome addition to this glaze! Grease a standard 8x4 or 9x5 loaf pan. Cut parchment paper so it will lay in the bottom of pan and come up the two wide sides of pan. Trim excess paper that extends beyond the lip of the pan. In separate bowl, whisk 2 cups (250g) flour, 2 teaspoons baking soda, 1/8 teaspoon salt, and ¼ cup brown sugar. Stir in ¼ cup chopped toasted walnuts or pecans and ¼ cup shredded desiccated coconut with the dry ingredients. Add 1/3 of the dry ingredients to the wet ingredients and fold in carefully. Repeat two times. Do not to overmix. Bake for about 40 minutes checking in the last 10 minutes with a toothpick for doneness. Pull it out and drop the pan on a rack for 10 minutes. Remove the bread from the pan and let it cool completely. Mix 2 Teaspoons butter, 2 Tablespoons lime juice, 2 Tablespoons dark rum, and ½ cup turbinado sugar in a small saucepan. Heat on the stove over a medium heat until hot and bubbly. Stir in powdered sugar ¼ cup at a time until the mixture becomes viscous, like honey. Pull it off the heat and stir in 2 Tablespoons of nuts and 2 Tablespoons shredded coconut. Spoon glaze over loaf of cooled bread sitting on a rack. Cover top and sides completely. Allow the glaze to cool and set for about 30 minutes. This recipe is a winner! We loved the unexpected zing from the addition of the lime juice to the glaze. It brings a freshness that you would only get in a glaze and might lose if it were incorporated in the bread itself. Next time, we might try it in both places, substituting some of the baking powder with baking soda and letting the acid from lime juice help leaven the loaf. Worth a try! I also want to experiment with more bananas. They’re pretty subtle in this recipe, which is interesting since banana isn’t usually a subtle taste. I don’t usually put it in my smoothies because it’ll overpower everything else in there; yet here, it is delicate. I’ll also try playing with the ratio of lime juice to rum a little bit in the glaze. I like the rich taste of Cruzan Black Strap rum – it goes really well with the turbinado sugar and I’d like to bring that out just a bit more. Finally, I want to talk about the sweetness of the bread. I really like how it isn’t very sweet at all. It tastes like bread, not a cake. This fact really makes the glaze work very well with the bread as partners in a delicious culinary caper.